As a digital marketer or an SEO, we all have met that client who is yet to see the true colours of digital marketing or understand its true potential. 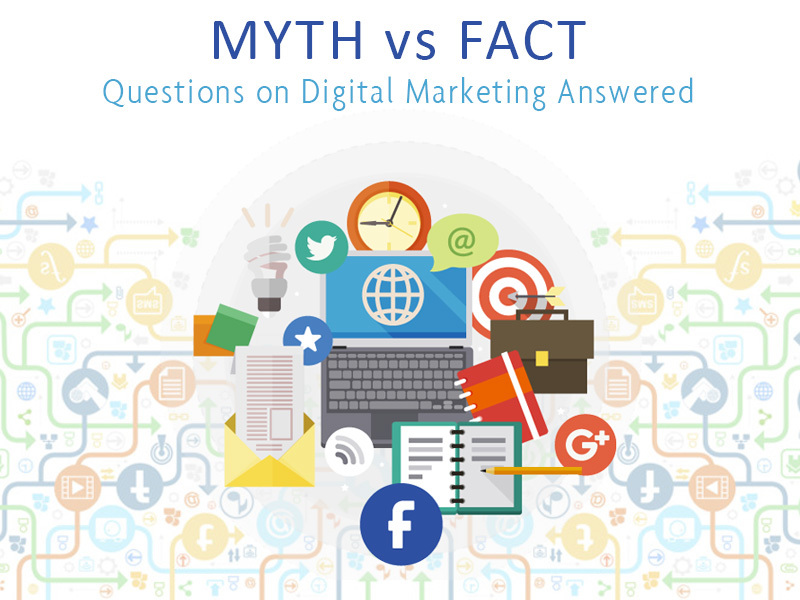 While many digital marketers in Sri Lanka and around the world have continued to debunk the myths about digital marketing, it pays to take a look at some of the latest and the most common myths and misunderstandings that still prevent businesses exploring the true potential of Digital Marketing. According to Nielsen Sri Lanka 2016 review, the total ad spend in Sri Lanka for the year 2016 was 90 Billion LKR and 70% of it is still being spent TV. While Sri Lanka had one of the biggest growth in digital marketing ad spend in the Asia-Pacific region for the year 2016, according to the Magna Advertising Forecast report, the ad spend was comparatively lower than the conventional media. Although the tendency of local marketers is to allocate a merger budget for digital marketing it is essential to rethink the digital marketing ad spend in comparison to marketing targets an organisation or a business needs to reach. While Digital marketing channels are 100% scalable, whereas an advertiser can run ads with different budgets to suit each audience and requirements with no specified minimum amount, the marketing objectives of each organisation and each campaign require a specified budget to receive the fullest results and expecting a hundreds of leads with few dollars is equal to a modern day pipe dream. Another old but a common myth. Since creating a social media page on any channel carries no payment many tend to assume that social media marketing especially, social media maintenance cannot cost an agency any expenditure. Many had been the times that a client had been surprised that social media marketing doesn’t inevitably include social media maintenance “because it costs nothing at all”. Yet social media marketing, which includes social media maintenance plus advertising does not and cannot come cheap. Each exercise includes media creation which in turn involves graphic designing and creative writing professionals and placement of a social media post or an ad requires a whole heap of prior analysis and research to reach its full potential and required trained and qualified digital marketers. Understanding the difference between posting an image on Facebook or Instagram and social media marketing can help many organisations gain a high visibility online. While millennials, or the people born after the year 1980 and reached legal adulthood by the turn of millennia, are one of the game changers in advertising and was the first generation to grow up with the internet and mobile phones. Not only are they addicted to being constantly connected and have a lesser attention span they also demand quick responses and solutions which make them the ideal audience for everything digital advertising. Yet this does not mean people who are older than millennials, which are generation X and baby boomers are completely immune to the siren call of social media. Out of the 5 million Facebook users in Sri Lanka, 24.5% are above the age of 35 years with the oldest millennials are still being 37 years old. Maybe one of the most painful and damming misconceptions. It is also the one that hurts SEOs around the world most next to the myth that SEO doesn’t work. Incidentally, it is also one of the hardest myths that refuse to die even when challenged with facts and hard data. While a website can go through an initial SEO process at the beginning, Search engine optimisation is necessarily an ongoing process which includes minor and major tweaking in content, tags, and internal and external link building. The content in a website, as well as its external links, tend to get outdated while search engine algorithm trends change several times each year. Links get broken and web-pages get removed creating a whole heap of SEO issues. Therefore considering search engine optimisation of a company website as a once in a lifetime task or a project that requires the same amount of resources over regular intervals is a misconception that can hurt your website and brand visibility. Many digital marketers, as well as CMOs, consider search engine marketing ads or text ads as a primary source of traffic to a website, which in turn can generate leads. However other than lead collection SEM ads also serve an important role in preserving a brand’s presence online. If a brand can dominate the SERP with paid and organic positions, it can evitably make sure they are having a front seat to the user's mind. Suggesting a good old email marketing campaign to retarget can meet many questions such as ‘I don’t check my email anymore’ or ‘Won’t it end up in spam?’. While no one ever admits to being susceptible to digital marketing in general, data tells a different story. Even in this day and age of social media and chat platforms, opt-in emails are one of the most successful marketing methods, with a high ROI and conversion. Think about it. Even with the threat of spam and virus if people trust your brand and website to provide you with their email could it be that they are keen to hear more about it? Another common but a painful mistake made by digital marketers as well as marketers is to underestimate the power of a well-optimized landing page. Many consider a lead collection landing page as an extra luxury or an investment and consider directing online to ads to the website’s home page or inquiry page as a sound alternative. But can the inquiry page or the home page of a corporate website perform the same way as a landing page in collecting leads? A landing page provides the same look and feel of the main website, but its content is more focused on providing the right message to the user arriving there through an online ad. Its main objective is to collect emails and personal information and gently nudge the users toward conversion. It is devoid of the extra navigation options to distract the users from registration and creates a unique conversion funnel which is not generally found within a normal website or an inquiry page. Therefore to debunk one of the most prevalent yet unchallenged myths in the trade, linking your online ads to the inquiry page or the home page of the website instead of a landing page can be a bad investment that reduces the effectiveness of your online ads. Keep abreast with the latest developments of the ever changing digital marketing field. Share your thoughts, ideas and inspirations with fellow digital marketing geeks across country and keep the dialogue rolling.